InSanity lurks Inside: Star Wars Land Announced for Disneyland and Disney World Hollywood Studios! 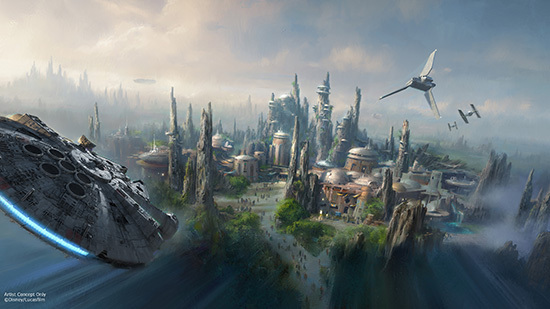 Star Wars Land Announced for Disneyland and Disney World Hollywood Studios! Yep, you read that headline right. Just a short while ago, at Disney's annual D23 Expo, the announcement of the long anticipated Star Wars Land was finally made. It was never a matter of "if", but always when with this one. Now, though? We have the details go along with it and just what guests will be able to expect from this massive new project that will be going on at not just Disneyland but also Disney World. Since this is a breaking story, we don't have all the details yet, but here's what we do know! So, just what can we expect? Well, here's the breakdown on things. Both parks will be a massive 14 acres in size. If that doesn't sound big, just think of the fact that this will be taking up most of the space in the existing Disney Hollywood Studios at Disney World for starters. There's at least two new rides coming along with this, and one of them, you'll be able to pilot the Millennium Falcon in one of two new signature attractions coming to each land. The other attraction will put guests right in the middle of a climactic battle. I think the last pic is possibly from that? Hard to say. Now, for a few more concept pieces to show off just what the future looks like in a park not so far far away. 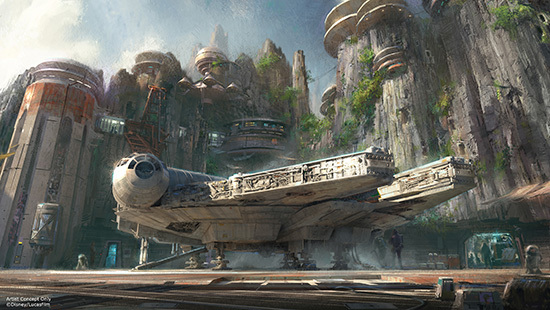 More Star Wars Land Concept Art! Possibly for the Millennium Falcon ride? Stay tuned for more details as we get them on this monster announcement out of Disneyland and Disney World! "Insanity Lurks Inside" is a blog about Theme Parks/Amusement Parks and all the goodies that go along with them. We offer up to date coverage on construction and breaking news from the world of Theme Parks/Amusements, Resorts and More but we also offer our own reviews of these parks! During the Halloween Season we also offer Haunted House Coverage, Reviews and News. Not only do we keep tabs on the industry giants like The Walt Disney Company Parks, Universal Studios, Seaworld Parks, Six Flags Parks and Cedar Fair Parks. We also try to focus and bring you the lasted news from the smaller, local parks which sometimes are overlooked. With Google+ shutting down, follow us on Facebook for updates!